A gentle heart stopped beating and heaven received a special angel. Our beloved Mother passed away on October 7, 2018 at the age of 96 and went home to be with her Saviour Jesus Christ. Mom was born on April 22, 1922, in Beausejour, the eighth child of her parents James and Adeline Storsley. Left to cherish her memory are her three children, Elaine Wilson, Les Leiman (Rita) and Karen Leiman, loving grandchildren Scott Wilson (Carrie), Graham Wilson (Emy Lou), Brock Wilson (Kristalee), Kailey Penner (Erny), Jason Leiman (Jodie), Trish Forde (Dan), Tamatha Hanke (Darren) and Jaklynn Smolders. Mom also had 15 Great Grandchildren who were very special to her, lovingly calling her “Great Mama”. Mom was predeceased very suddenly by the love of her life, Jack Leiman, leaving her to raise three children alone. Her strong Christian faith gave her the strength to carry on. She leaves a wonderful legacy for her family: the importance of family, as she loved hosting/attending family functions, and the value of education. Also, she was actively involved with the Beausejour Elim Baptist Church, and contributed to the community with her various volunteer opportunities. Mom loved to play games and was very competitive, especially in games of scrabble and Skip Bo. At age 96, she was still doing the Jumble and Word Search. She loved horseback riding, base ball, lawn darts, and curling. “Grandma Lawn dart” was a force to be reckoned with at family tournaments at the cottage. Her passion for sports has been passed down to three generations of her family members. Her hands were always busy as she enjoyed gardening, cooking, baking, sewing and knitting. Each of her grandchildren and great grandchildren received beautiful hand knitted sweater sets, hats and mittens that she made with love. The family will miss her sense of humour, with her ability to tell jokes and have everyone in stitches with her “one liners” right up to last few weeks of her life. We will cherish her memory and she will forever be in our hearts. Heartfelt thanks and appreciation to the Donwood Manor Personal Care Home staff for their wonderful care, compassion and kindness. If desired, donations may be made to the Donwood Manor Personal Care Home or the Beausejour Elim Baptist Church. Do a kind deed or say a kind word to someone who needs you. Then our Mother will live on forever. My deepest sympathy to you all in the passing of your Mom. I remember her as a quiet lady with a beautiful smile. At the end of the day its not about what you have or even what you have accomplished…its about who you’ve lifted up, who you’ve made better. Its about what you have given back. Cherish your memories of a life lived well. 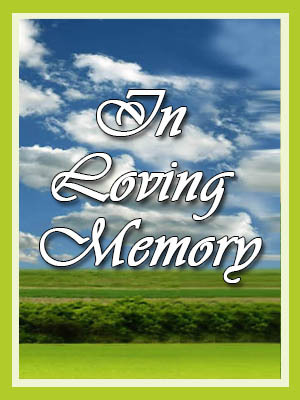 My sincere sympathy is with you all in the passing of your dear Mom and Grandma.